The 2019 Ram 1500 is getting a mild hybrid system, with an electric motor boosting all gas V6 and some V8 trucks. Projected gains are significant, but don’t expect record-smashing mpg. In a presentation at the Detroit Auto Show, the Head of Ram Brand Mike Manley announced that the 2019 Ram trucks with the new eTorque hybrid system should see “at least a 10 percent improvement” in fuel economy figures. Interestingly, Ram trucks communications guy Nick Cappa told us and then confirmed that the figure was up to a 10 percent improvement claim over the combined highway/city fuel economy figure. But no Ram reps would specify whether we’d see that improvement on the V6 or V8 or both. 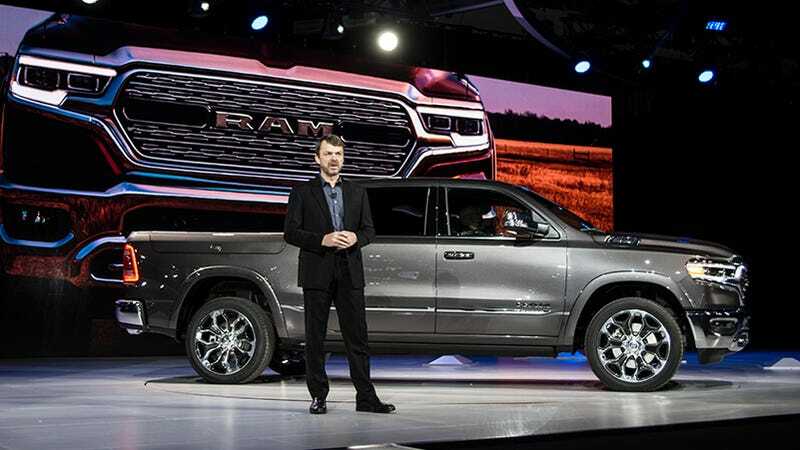 Assuming Manley was referring to the 3.6 liter V6 Pentastar 2WD 8-speed automatic truck, which is currently EPA rated at 20 mpg combined, the 2019 Ram V6 2WD should hit 22 mpg combined. If he was talking about the V8, now EPA rated at 17 mpg combined, the new combined figure could be more like 19 mpg. Of course both trucks would turn out higher highway figures, and that’s where the bragging rights will be on mpg claims, even if the biggest gain from the current number is realized in the combined rating. For your reference, a 2018 Ford F-150 with the 2.7-liter V6 turbo with 2WD is already rated at 22 mpg combined. But considering the fact that Ram is running essentially the same engines, the same transmissions, with mild aerodynamic tweaks and a modest weight reduction, 10 percent better fuel economy from a little Motor Generator Unit seems decent. As for the diesel, there’s no news yet, except that it is coming back. “When our Diesel arrives in 2019,” Manley said during his presentation, “we’re gonna reclaim all claims that we have.” That’s a bold thing to say considering the fact that the 2019 Silverado’s specs haven’t been printed yet, but I’m excited to see the truck wars heating up over efficiency.